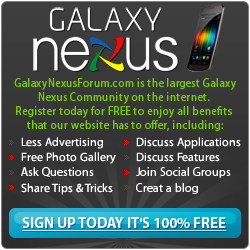 Welcome to the Galaxy Nexus Forum, a Galaxy Nexus Community that features tons of Galaxy Nexus information and help. We aim to be a friendly, educational community dedicated to all things Galaxy Nexus related. We offer assistance with Android, Galaxy Nexus Hacking, Galaxy Nexus Apps, Galaxy Nexus Accessories, Galaxy Nexus Specs, Galaxy Nexus Help and more. Galaxy Nexus Forums - The main area of our site, forums covering the Nexus Galaxy. Galaxy Nexus General Discussion - The General Discussion area for the Nexus Prime. Galaxy Nexus Help - If you need help with your Galaxy Nexus, ask in this forum. Galaxy Nexus Apps - Discuss various Apps available for your Nexus Prime here. Galaxy Nexus Accessories - Discuss the various Galaxy Nexus Accessories available here. Our community is about to get a little bigger. We're going be merged with our sister sites, Nexus 4 Forum and Nexus 7/Nexus 10 Forum, into Google Nexus Forum! We're excited to be better able to support the entire Nexus line of devices with this joining of forums. You don't need to do anything special, as the merge will bring over everyone's account info. But you will probably be unable to access the forum for a little while at some point today or tomorrow. Don't worry! Just check back later and you'll automatically be redirected. You'll also be able to access the new forum through Tapatalk after everything's been moved over. Thanks for your participation in Galaxy Nexus Forums and we'll see you over at the new GNF!! Most users ever online was 2,937, 07-23-2012 at 03:37 PM.